Daunting is sitting down at the keyboard to attempt to do justice to a review of Canon's flagship flash, the Speedlite 600EX-RT. Few aspects of an image are as important as the lighting – arguably being second only to the subject and perhaps the composition? Good lighting overcomes so many other issues. With one or many 600EX-RT flashes available for use, you can take control of the lighting. In doing so, this device (singularly or in multiples) has the power to completely transform the quality of your images. Daunted, where do I start? How about the owner's manual? Opening up the 600EX-RT owner's manual PDF foreshadows the incredible functionality this flash has to offer. It is a whopping 372 pages long – only 64 pages shy of the huge owner's manual for Canon's current top-of-the-line DSLR, the EOS 1D X. Skimming through the PDF, I realized the English portion of that manual is a less daunting, but still involved, 121 pages. Obviously I'm going to be skimming the surface of the capabilities of this flash to keep this review to a readable length. What you need to know first is why you need a flash and second, if the 600EX-RT's capabilities make it the right model for you. Hopefully you will find some inspiration injected along the way. Why do I need an Accessory flash? The uses for this device are only limited by your imagination. And the results of using the Canon Speedlite 600EX-RT Flash are potentially incredible – again, only limited by your imagination. As with all flashes, the 600EX-RT is designed to add light to your scene. The amount of light added can range from a little to all of the light captured in the exposure. Use flash when there is not enough light or when there is none at all. When a scene is already well-lit, add light to fill in harsh shadows. Did you ever shoot in a venue with direct downward lighting? Downward lighting creates raccoon eyes on your subjects – eyebrows shade the most photographically important part of your human subjects. Small and/or distant light sources also create harsh subject lighting. The answer to the why do I need an accessory flash question may be obvious to owners of camera bodies without a built-in flash, but not so clear to those using bodies with a built-in flash. The built-in flash is great for fill (set your exposure for the ambient light, then dial in -1 to -2 EV FEC/Flash Exposure Compensation). The built-in flash will add light to the shadows and add catchlights (sparkles) to the subject's eyes – at short distances. The problem is that the range of the built-in flash is very short and the benefit of that flash is minimal in terms of overall image quality because it lacks an important feature – the ability to tilt and swivel. I'll come back to this point soon. A flash can also improve the spectrum quality of the light reaching a scene. Not all light is created equal and some light is quite lacking in regards to its spectrum profile. The color quality coming from accessory flashes are optimized for photographical purposes and can overcome the color deficiencies found in ambient light sources when used as the full lighting for a scene. When including ambient light in the exposure, the flash will need to be gelled to match the color of that ambient light so that white balance can correctly be obtained (more to come). A huge benefit of an accessory flash is being able to change the size and shape profile of the light reaching your subject. Using the tilt and swivel feature of the mid and high end flash models, light can be bounced from an appropriately-colored reflective surface. The color of that surface ideally will be light (dark colors absorb more light) and neutral enough that a strong color cast is not introduced into your image. A wall or reflector is commonly used for on-camera bounced flash. If used off-camera, a flash can be bounced from an umbrella. An off-camera flash can also be fired through a softbox, shoot-through umbrella or diffusor. The bounce and diffusion options can result in a larger light source relative to the size of the subject for a generally much-preferred soft look to your lighting. Light fall-off across your image can also be controlled by varying the distance between your flash and your subject. Let's take a look at an example that I created for the Speedlite 430EX II Flash review. A Canon EOS 50D with a Canon EF 85mm f/1.8 USM Lens was tripod-mounted in vertical orientation (flash on camera left) for these comparison portraits. Yes, my beautiful model moves a bit between each comparison shot – she thought she needed a sip of tea during each flash change. She is sitting on a stool in a simulated corner of two white walls (the wall to camera right is actually a very large reflector). A single flash is the only light used for each of these shots. At even this relatively short distance, the 50D's built-in flash required ISO 200 and full power plus .25 stops added in post processing to reach this f/8 exposure brightness. The old featureless fixed head Speedlite 220EX had enough power at ISO 100 to reach the similar exposure. Aside from power, the shoe-mounted flashes aimed directly at the subject do not offer much (if any) image quality improvement over the built-in flash. As the flash height increases on the hot shoe, the shadows lengthen – which is not a benefit aside from sometimes reducing the red-eye effect. Interesting is that the shadow from the 430EX II is darker than the shadow from the built-in and 220EX flashes. The 430EX II's auto-zoom feature would have directed more light onto the subject - and less would have bounced off of the side wall to fill the shadows. Of course, I could have manually chosen a wider angle flash head setting on the 430EX II, but the cup of tea was empty by then. The 600EX-RT, with its zoom head, would have delivered a result very similar to the 430EX II. Adding a rotatable/flip-able flash bracket for the shoe-mounted flashes would have improved the quality of the direct flash for this vertically oriented portrait simply by sending the shadows downward. All of the direct-flash images would appear nice compared to a flashless capture in this scenario (the subject was in very low light) – if you had not seen the bounced flash examples. When the flash is close to the axis of the lens, the light looks unnatural and out of place. The reason for this is because we rarely view the world with a bright light emanating from our foreheads (spelunkers are an exception to this rule). Start bouncing the flash and everything changes. The source of the light becomes the object the light is bounced from. The reflective surface is typically something very large – and white in color is usually preferred. In the bounce example above, the flash was aimed into a white reflector held up to the back of camera left (the edge of a wall and ceiling often works well). The large size of the light source delivers a softer light, wrapping around the subject. The harsh shadows below the jaw line (right side in examples above) and on the background are greatly softened. With the 430EX II doing the bouncing, ISO 400 was needed to achieve the proper exposure in this portrait. The additional power of the 600EX-RT would have been a big benefit here. Another benefit the 600EX-RT has is that the flash head rotates 180 degrees in both directions. The 430EX II rotates 180° in the counter-clockwise direction and but only 90° clockwise. In the specific example above (which is often be encountered in the field), I needed the 430EX II to rotate into the 430EX II's dead zone for optimal positioning. Ideally, the flash would be directed upward over my left shoulder, but I settled for rotated 180° back and tilted one click short of 90° for this example. I'll pay a lot more attention to off camera flash use later, but I think you'll agree that the umbrella example above is the winner in this competition. A shoot-through diffuser is another optimal light modifier. Shoot-through diffusers include things such as softboxes, umbrellas, commercial diffusers, bed sheets and even transparent shower curtains. 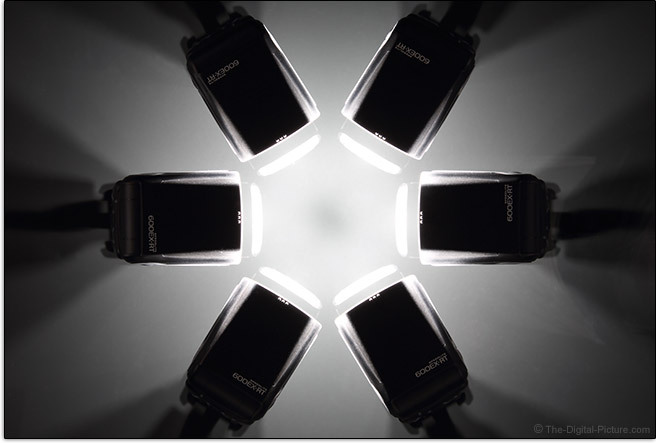 Accessory flashes allow the use of a great abundance of direct-attached light modifiers. These modifiers range from complete gimmick to must-have in their usefulness. To be used for direct flash applications, a modifier must be very significantly larger than the flash head and sufficient internal diffusion must be incorporated to allow the flash to adequately and evenly light the entire front surface area of the modifier. There is a lot more flexibility in size when some or all of the modifier's light will be bounced. One of my favorites is the Sto-Fen Omni-Bounce diffuser. This small, rugged, inexpensive accessory creates a bare-bulb effects that sends light in all directions. You end up with a combination of direct and bounced light on your scene. Note that any flash accessory counting on bounced light is only going to be effective when a reflective surface (wall, ceiling, etc.) is present. You are simply wasting battery life if using these devices on an open beach, in an open field, in a large arena, etc. While devices like these were sometimes used to reduce flash output long ago, modern flashes are capable of reducing their output to low levels without this help. Providing a focus assist light is another advantage that flashes provide. While built-in, low-end and compact flashes can help with focus acquisition in low light, they use a series of very distracting quick flashes to do this. The higher end flashes including the 600EX-RT project a much less intrusive red grid pattern when focus help is needed. Eliminating motion-blurred images is another challenge that flash can help you overcome. Stopping fast action can be challenging under all but under the brightest lights. And holding a camera still enough to capture sharp, motion-blur-free images can also be challenging. Because the light output from a flash happens with such short duration, a flash is able to freeze even very fast motion, making sharp photos almost guaranteed (if correctly focused of course). A very significant percentage of photographers find at least one accessory flash to be an important part of their kit for one or more of the reasons listed above. Power is one of the features you are looking for in a flash. By power, I am talking about how much light the flash can generate. Manufacturers rate their flashes for power output using the "Guide Number" spec, indicating the max distance a flash can light a subject. GN = distance × f-number. Unfortunately, this spec is difficult to use for comparative purposes. The better flashes available today have the ability to focus their beam of light, allowing a higher percentage of the light output to cover only the angle of view of the lens focal length being used. Or, more light can be focused in the center of the frame to create a vignette effect. Manufacturers typically take advantage of the light-focusing capability of their flashes to assign the GN spec. If the flashes being compared do not have the same max focal length, one flash gains an advantage. In the case of the 600EX-RT, no other Canon flash is able to zoom out to 200mm. So, unsurprisingly, the 600EX-RT also receives the highest guide number rating of 196.9' (60m). Canon also provides the GN at the 600EX-RT's widest angle (without the diffusion panel in use). That number is a far lower 85.3' (26m). Since no other Canon flash is able to zoom out to 200mm, there is again no comparative spec found here. It is sufficient to say that the 600EX-RT has enough power to make it your Canon flash of choice when you need the most power available. And power is indeed very important – especially if you are using bounce flash or shooting through/into a flash modifier such as an umbrella or softbox. I'll share an example. While outside one evening, the dog apparently met an unsociable animal. 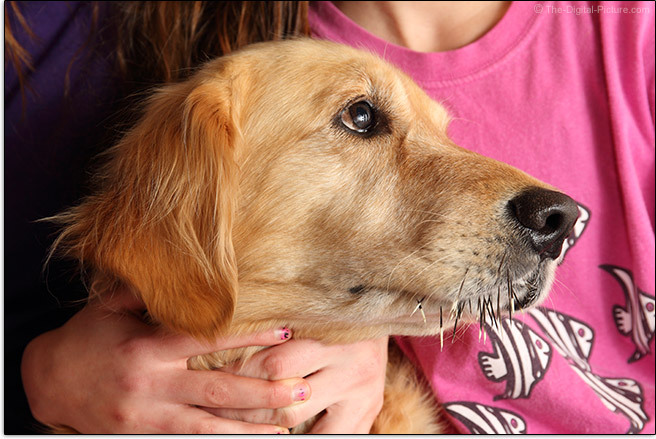 She came in looking guilty and wearing a snoot full of porcupine quills. Of course, all of the girls went into panic mode. While the wife went for the pliers, I went for the camera. The 600EX-RT was ready to go. I locked it to a EOS 5D Mark III that already had an EF 24-70mm f/4 L IS USM Lens mounted and quickly captured a memory. You are of course asking how this little story relates to flash power. The subject was close. It looks like a shot that any flash could handle. But, I'm using bounce flash and practically the only bounce surface I had to work with (where the kids had the dog locked in place) was a white-legged kitchen stool. If you look at the unique catchlights in this f/8 image, you will see the very small surface area that created this very adequate amount of light. While this image capture was not of great importance (just a memory), the bounce flash results in a very nice lighting. The broad off-camera-axis light source allows shadows to create dimensionality, but those shadows have soft transitions for a pleasing appearance. Having bounce flash capability at your next wedding or other event may be extremely important. Unfortunately for flash photographers, important events are typically held at nice venues that have high ceilings. It takes a lot of flash power to bounce from the high ceilings and still properly light the subjects, and for that reason, the 600EX-RT should be your choice if using a Speedlite. There are ceilings beyond the reach of even a 600EX-RT, but in those venues, you are going beyond the capabilities of a Speedlite. Having the most power available gives you the option to bounce from less-adequately-sized and/or more distant surfaces. In case you were comparing the size of the flash heads and thinking that the larger head should provide softer lighting on your subject, let me assure you that the difference is not big enough to matter. As can be seen in the portrait demo above, even the largest flash has a small head relative to the size of all but the tiniest subjects at very short (near 1:1 macro) distances. While the 600EX-RT has the largest Canon flash head available, that size will make little difference in your subjects. But the additional power this flash has will indeed make a difference – when you are bouncing or diffusing its light output. Need more power? Add more flashes. Each time you double the number of flashes in use (assuming they are the same model/power), you get twice as much light available for use on your scene. If you don't need twice as much light, the use of additional flashes will allow lower power settings to be used. Lower power settings deliver shorter bursts of light that freeze even faster action (think hummingbird photography) and recycle more quickly. I want to take a tangent and review the differences between the 600EX-RT and its predecessor, the Canon 580EX II Speedlite Flash. The 580EX II is a very capable flash and has been my choice for years. But for the last year and a half, I've been using a 600EX-RT and a Canon ST-E3-RT Speedlite Transmitter when no more than one off-camera flash was needed. I've been so pleased with the performance of this system that I recently upgraded 5 additional Canon 580EX II Speedlite Flashes to 600EX-RTs along with a second ST-E3. From this point forward in the review, I will be frequently comparing the 580EX II to the 600EX-RT as features and capabilities are discussed. Here is a list of some of those differences. There are a lot of settings possible on this flash and inadvertently changing one could spell trouble. Simply change the switch to "Lock" and your settings will be unchangeable. The 600's power switch is also slightly reshaped, but ... I don't find either shape an advantage. Both are easy to use. Obvious in the above "On" comparisons is the 600EX-RT's new dynamic 104 x 172-dot LCD display. This upgrade and the button changes that accompany it are huge. The Mode button is now moved out of the group of buttons located directly underneath the LCD into an easier-to-use position with an easier-to-use larger size. As you will see in the many examples below, the four under-the-LCD buttons dynamically change their function relevant to the current mode and menu. Note the great addition of a dedicated wireless mode button. We'll next take a look at the Zoom button. I'm not going to say that your Better Beamer Flash Extender is now obsolete, but ... your new flash has a more-narrowly-focused light beamed angle available than ever before built into a Canon EX flash. As noted before, the 600EX-RT will automatically select the proper zoom focal length to match your lens and sensor size. With a 20mm wide angle of light available, the 600EX-RT also goes wider than any Canon EX flash to date. If you need to go even wider, pull out and flip down the wide angle diffuser panel for a 15mm angle of view coverage. If you need to go wider still, add an inexpensive Sto-Fen Omni-Bounce diffuser. 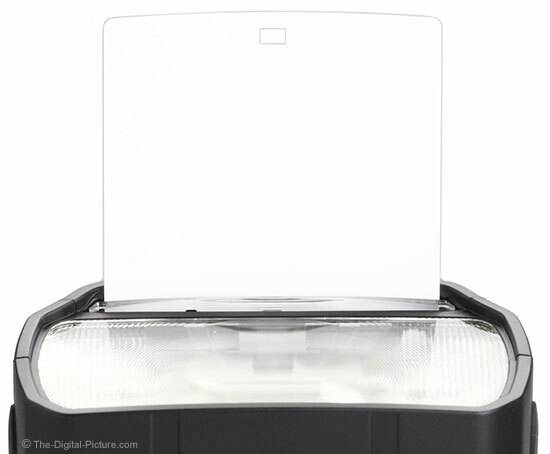 In addition to the pull-out, flip-down diffuser, the 600EX-RT also has catchlight panel. 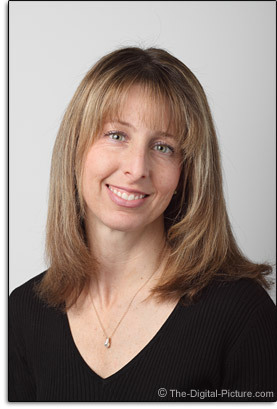 When using bounce flash, pull out the white panel to create a white catchlight reflection in your subject's eye. This panel is not new – the 430EX and 580EX II both have it, but it can be useful. 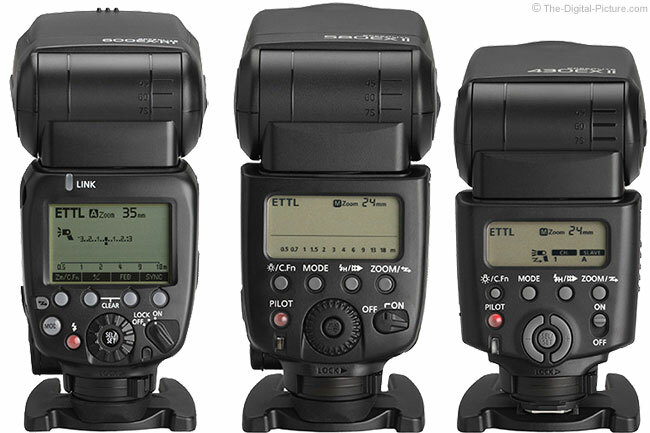 The 580EX II modes are not shown to compare the modes available, but to show some of the differences in the LCDs. The "E-TTL / E-TTL II autoflash system [snip] was developed to meet the demands of the digital camera era. This system fires a weak pre-flash just before the main flash, measures the flash intensity necessary to properly illuminate the subject, and then fires the main flash (this sequence takes place in an instant). 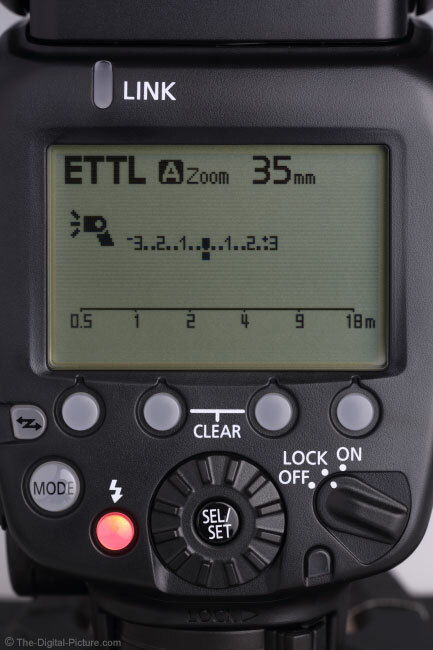 The E-TTL II autoflash system provides even more precise and stable flashes by utilizing the lens-to-subject distance. The system's algorithm is actually contained in the camera, so the system can be improved with each new model development." Basically, in E-TTL mode, the camera automatically takes care of the flash power output. You simply install the flash on the camera and power it on. The camera does everything else. The camera's mode setting is also important in determining the flash exposure in ETTL mode. I typically use Av mode when using flash for fill and use the camera's M (Manual) mode for flash-as-main-light photography. In the latter case, the camera determines how much flash is needed for proper image brightness at the aperture, shutter and ISO settings I chose. FEC (Flash Exposure Compensation) is used to make any adjustments needed. If you want to take full control of the amount of light the flash is providing, use the flash's M (Manual) mode (highly recommended in some scenarios). Manual flash output from 1/128 power to full 1/1 output can be dialed in (in 1/3-stop increments). 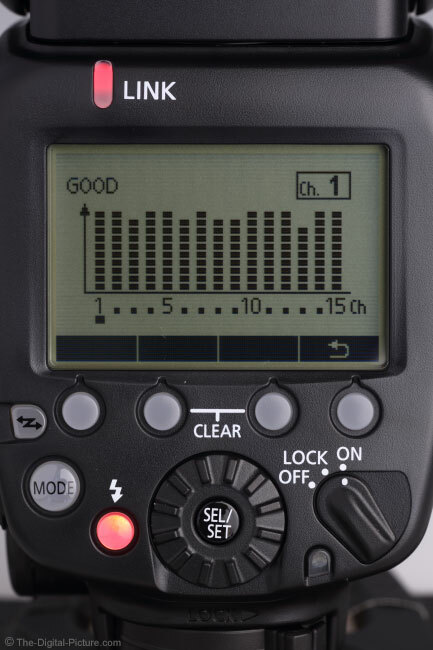 Multi mode enables stroboscopic flash. Multi mode is typically used with a long exposure to capture the same subject in multiple positions within one frame. The flash output, number of flashes, and flash frequency are settings available for this mode. EXT.A (Auto External Flash Metering) uses the 600EX-RT's external metering sensor to measure the flash reflected from a subject in real time. The flash ends the exposure when the standard brightness level is reached. EXT.A can be used only with the EOS DSLR cameras released since 2007. EXT.M (Manual External Flash Metering) also uses the external metering sensor, but the camera's ISO and aperture values are entered into the flash. The flash output is then based on the values entered. EXT.M mode is compatible with all EOS cameras. The Group mode is available with wireless flash. More about this soon. As Canon's flagship flash, the 600EX-RT gets a full feature set. Demonstrated below are some of them. Tell the flash to increase or decrease its output by using FEC (Flash Exposure Compensation). Tell the flash to produce bracketed output using FEB (Flash Exposure Bracketing) (does anyone use this?). Though the flash does not offer as much power in HS Sync (High Speed Sync) mode, the cameras fastest x-sync shutter speed can far be exceeded in this mode. All flashes default to first curtain sync where the flash fires just as the shutter opens. If the exposure being used is long enough for subject motion blur to become part of the final image, this will mean that your subject will have moved after the flash’s light illuminates them. The result is blurred streaks in front of the subject. In this case, it is best to use 2nd curtain sync. In 2nd curtain sync, the flash fires just before your shutter closes, causing the blurred motion streaks to show up behind your subject which results in a much more pleasing looking image. While the 580EX II had Custom Functions, setting them and determining what settings were already in use was challenging due to the cryptic LCD information. 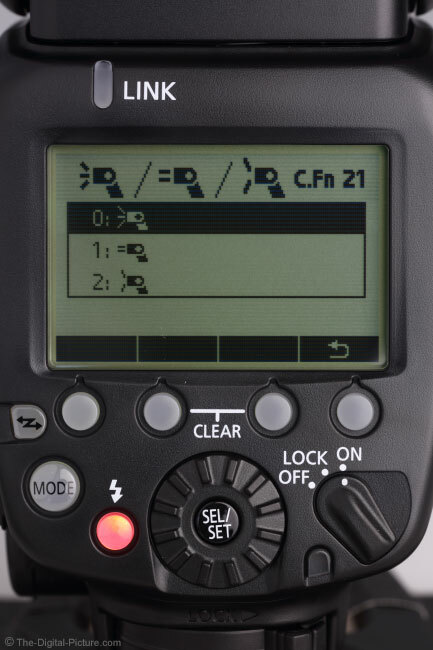 With the 600EX-RT's new LCD, no longer is an owner's manual or cheat sheet required to set CFs along with the new PFs (Personal Functions) found on the 600EX-RT – usually. You might need to read initially to understand all of the symbols being used. C.Fn-21, Light distribution, is a new feature and worth a brief explanation. When Auto Zoom is selected, the evenness of light across the frame can be adjusted using via flash head's zoom capability. Standard Coverage is what we are used to. A modest darkening toward the edges of the frame may be seen when this mode is used. The new modes are Guide number priority and Even coverage. Even coverage aims to provide very even light across the entire frame. Guide number priority will place more light in the center of the frame with the periphery going darker. Use this mode to draw focus toward the center of the frame and/or to maximize the reach of your flash. Will this feature get used? I don't know. While potentially useful, those with this level of demand over their flash's light distribution are probably going to be manually selecting their focal length and flash power settings without digging into the Custom Functions. 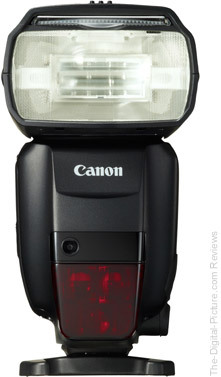 As I've briefly touched on throughout this review, the Canon Speedlite 600EX-RT Flash has wireless remote capabilities. Getting your flash off camera opens the door to the much more impressive capabilities of flash photography. The 600EX-RT can control another Speedlite with remote slave capabilities or can be controlled by a Speedlite or Speedlite Transmitter with master capabilities for a very small/light/portable/flexible lighting system. New for the 600EX-RT is a sorely-needed wireless button. The original 580EX had a switch that made setting slave and master modes very quick. The 580EX II required an inconvenient and not-so-intuitive 2-second press of the zoom button to get into the wireless modes. 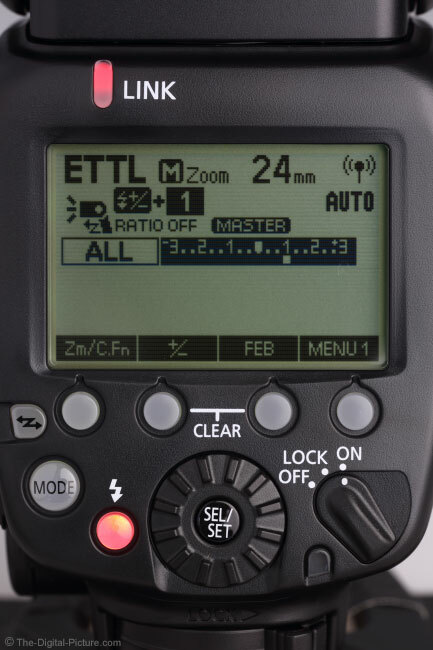 The 600EX-RT's new mode button allows quick and logical selection of wireless modes. No longer is line-of-sight and a specific angle-of-view required to control remote slave flashes. I have long used Canon's optical wireless system and could usually make it work fine. Non-line-of-site optical wireless sometimes works in limited instances if the light bounces off objects in the room sufficiently to communicate with the remote flash(es), but there were situations that this option would not work (through walls, sometimes in very bright sunlight). Other situations required adjustment of light modifier setup to make the slave flash unit's receiver able to see the optical communications. No longer do obstacles matter and remote flashes can be up to twice as far away indoors and three times the rated distance outdoors. Here are the four wireless modes including master and slave modes for both RF and optical wireless communications. 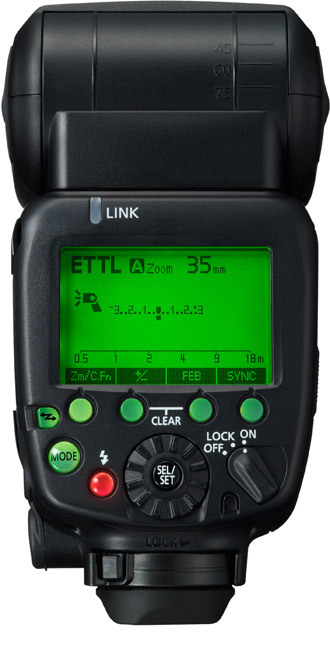 Via 2.4 GHz RF, the 600EX-RT (or Speedlite Transmitter ST-E3-RT) is able to control flash output for up to 5 groups (A, B, C, D & E) of up to 15 compatibles flashes (600EX-RT only at review time) communicating in one of 15 channels (default is Auto select) using one of up to 10,000 IDs (default is 0000) from up to 98.4 feet (30m) away. Each group can independently have its mode set to ETTL, M (Manual) or EXT.A (External Auto). 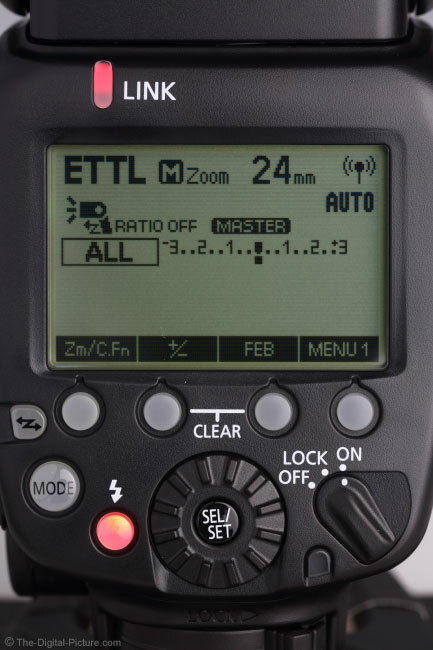 Ratios for each group can be set to up to +/-3 stops and the master flash can optionally not fire. Here is a look at some of the RF identification information/settings on the LCD. To insure interference-free communications, the 600EX-RT has the ability to automatically scan its 15 channels and automatically select the best available. Interesting is that the 600EX-RT, while manually set to a specific channel number, can produce a chart of the results of its scan. You can utilize this information to manually select the optimal channel for your venue. Bi-directional communications are now used in RF wireless mode. One advantage is that the slave flashes report to the master when they are ready and the master (optionally) beeps to let the photographer know this. 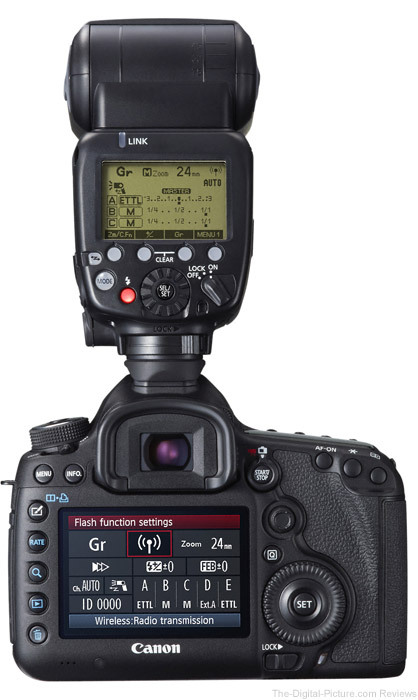 With a 2012-or-later Canon EOS DSLR (5D III and 1D X at review time), a Flash Quick Control screen is available for fast, easy setting changes – and for fast verification of the current settings. My experience with the 600EX-RT's radio wireless flash has been perfect. As long as I allow all slaves to fully charge, this system has been flawless in firing remote slave units. I have complete confidence in using them for shoots at any level of importance. Canon's optical wireless remote flash capabilities are not going away anytime soon. The optical wireless flash control is being featured in many current Canon EOS DSLR cameras and will remain the most-widely-used Canon remote flash technology for a long time. While RF and optical wireless modes cannot be used simultaneously, the 600EX-RT has full backward compatibility with Canon's optical wireless system. The 600EX-RT is able to optically control ratios in up to 3 groups (A/B/C) and is able to enable/disable its own flash in the mix. An unlimited number of slave units is supported. This is an advantage over the the RF system, but ... the percentage of photographers needing to control more than 15 slave units has to be miniscule. The transmission range for optical wireless communication are (periphery-center) 39.4'-49.2' (12m-15m) indoors and 26.2'-32.8' (8m-10m) outdoors. The extents of periphery optical wireless reception are +-40 degrees horizontally and +-30 degrees vertically. Four slave channel IDs are available to avoid conflicts with other photographers. Optical wireless compatible Canon Speedlite slave units can include, as of review time, the 600EX-RT, 580EX II, 580EX, 550EX, 430EX II, 430EX, 320EX and 270EX II. Check the flash specifications tool for more recently released flashes. I'm guessing that you will see "-RT" in the name of units containing radio wireless compatibility. For optical wireless operation, ETTL, M and Multi are the available modes and the master flash output can be disabled. For both RF and optical wireless operation, the master flash output can be disabled. If disabling the master flash output, the Canon Speedlite Transmitter ST-E3-RT (RF wireless only) and Canon Speedlite Transmitter ST-E2 (optical wireless only w/ AF assist) are often preferable for their significantly smaller size and weight. Note that even when disabled, the master flash may fire a preflash (making it appear to be enabled), but will not contribute to the exposure. FEC, FEB, FE-Lock and HS Sync are available in wireless modes, but lacking is second curtain sync. Second curtain sync is unfortunately limited to a camera-attached flash unit unless you use an accessory wireless trigger for the remote flashes. 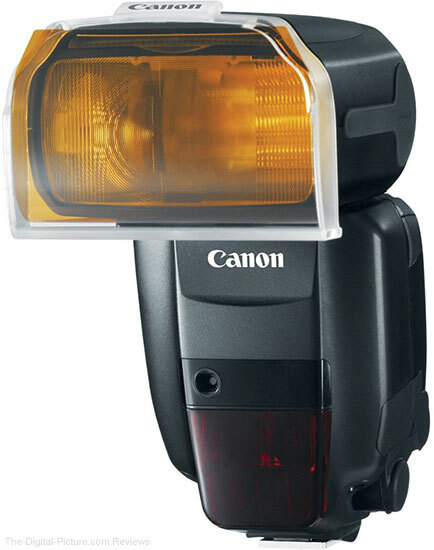 The Canon Speedlite wireless flash system is very easy to use. Simply open the boxes, insert batteries, power the units on, press the wireless button once to set one flash unit to master mode (same on a Speedlite ST-E3 Transmitter) and press the wireless button twice to set the other flash unit(s) to slave mode. RF wireless setup is complete. Everything will work. 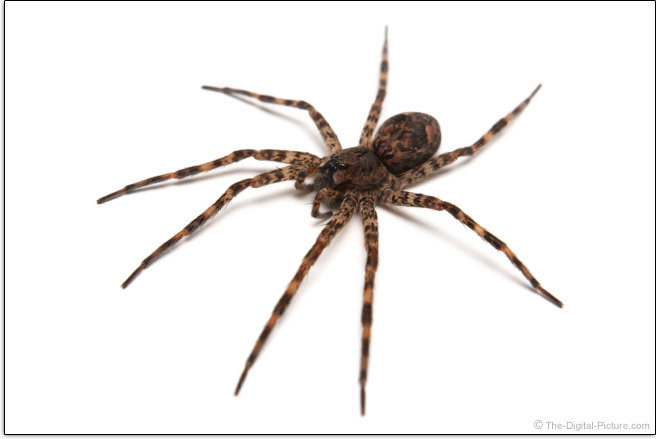 That is exactly what I did when my wife discovered this 3.25" (82.5mm) Wolf Spider in our basement. I was evaluating the Sigma 18-35 at the time. I grabbed it (mounted to an EOS 60D), put a Speedlight 600EX-RT in a small softbox, put a Speedlite Transmitter ST-E3 RT on the camera and created this image. There was very little setup time involved (important as I would have been in trouble if the spider had disappeared). Everything worked perfectly. Some positive FEC was used to brighten the white background at the time of capture and the background was made completely white in Photoshop. 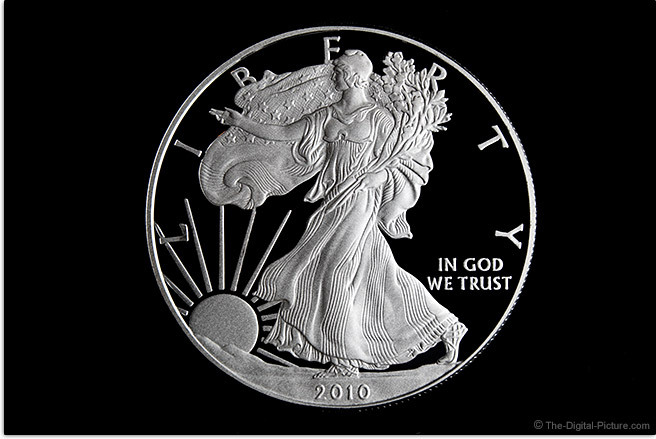 Here is another easy wireless flash capture utilizing a very reflective coin. The setup was nearly identical to the spider example with the Canon EF 24-70mm f/4 L IS USM Lens being mounted on a 5D Mark III this time. I mentioned before that there are a lot of settings on this flash. Now you can save these settings to memory for recall the next time they are needed – such as the next time you are shooting at the same venue. Want to reset a flash back to its default settings to quickly clear a complicated setup? Simply press and hold the center two function buttons. Not only can the Canon Speedlite 600EX-RT Flash control and be controlled by other Canon Speedlites and Speedlite Transmitters, this flash can control other EOS DSLR cameras. Via its remote shutter release capability, a slave 600EX-RT or ST-E3-RT can wirelessly instruct a single camera, with another RF-capable flash or flash transmitter mounted (limited to 600EX-RT or ST-E3-RT as of review time), to fire in single shot mode. The max range for this function is the same as the other RF wireless features – up to 98.4 feet (30m) away. 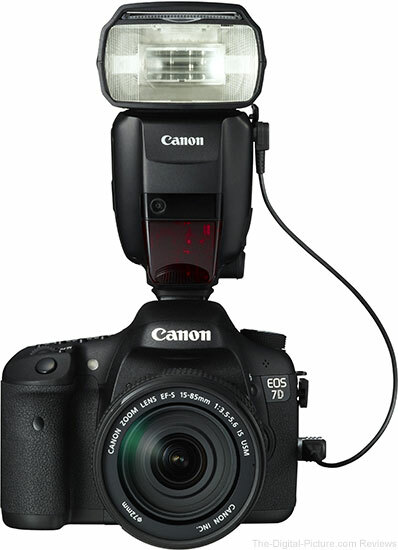 The EOS 1D X, 5D Mark III and post-2012-released EOS DSLRs will be triggered directly through the flash hot shoe. Earlier models require the optional Canon SR-N3 Release Cable (shown in use on an EOS 7D below) to function in this way. The SR-N3 cable requires an N3-type remote release port which leaves some lower end camera models (including the pre-2012 Rebel/***D/****D series with E3-type ports) unsupported. The flash or transmitter on the triggered camera can be instructed to fire or remain off for the exposure and can also control other slave flashes (via RF only). The triggering device is not required to be camera mounted. The remote release is triggered by pressing the slave's Menu 2 REL button. It might appear strange to be carrying just a 600EX-RT around, but the ST-E3-RT is very small and works ideally for this task. Using the Canon Speedlite 600EX-RT Flash's Linked Shooting feature, you really can be in up to 16 places at once. A 600EX-RT or ST-E3-RT mounted on a camera is able to remotely trigger up to 15 other remote cameras located within the max RF operating range. When I learned about the 600EX-RT's Linked Shooting capabilities, my first thought was to setup a bullet-time-style shoot. Bullet time videos generally utilize a very large bank of cameras, a great deal of wiring and computer triggering technology. A subject in motion is simultaneously captured from many angles using the still cameras. The still images are then incorporated into a video that pans around the frozen-in-time subject. Wireless triggering technology would eliminate the large wiring and triggering issues involved in such a shoot, but my limited number of fully compatible cameras (3) was going to make my shoot more of a proof-of-concept. What I learned is that there is a very short time lag from the first camera firing until the other cameras fire. This is not surprising, but if the slave cameras are not the same model, there may be a difference in their triggering lag time. My 1D X would trigger slightly faster than my 5D III, but multiple 5D III bodies would fire simultaneously. While more testing is warranted, the concept has potential. For other remote triggering needs, this system can work very well. Linked Shooting differs from Remote Release in that the remote shutter activation can be triggered from the master flash camera's shutter release (the REL button also works). Again, Linked Shooting can remotely activate up to 15 cameras whereas Remote Release will activate only one camera. These features are not available for optical wireless communications. Below is a table comparing the size and weight of some current Canon Speedlites and Speedlite Transmitters. For many more comparisons, review the complete Canon Speedlite 600EX-RT Flash Specifications using the site's Flash Spec tool. We have already talked about the first two models in this list. The 430EX II (also mentioned briefly) is the next-down model in terms of power and capabilities (lacking most notably wireless master capability). It is also next down the list in size, power and price. While you may think it is strange that I included the 90EX in the above list as this is currently Canon's least expensive flash model. I included it for two reasons. First, I included it for perspective. The 90EX is tiny and light. The second and more important reason for including the 90EX is that it has remote flash master capabilities. This little flash can control the 600EX-RT and other optical-slave-capable models, making it compete strongly against the significantly more expensive ST-E2. Unfortunately as I write this, the 90EX does not appear to be in good supply. 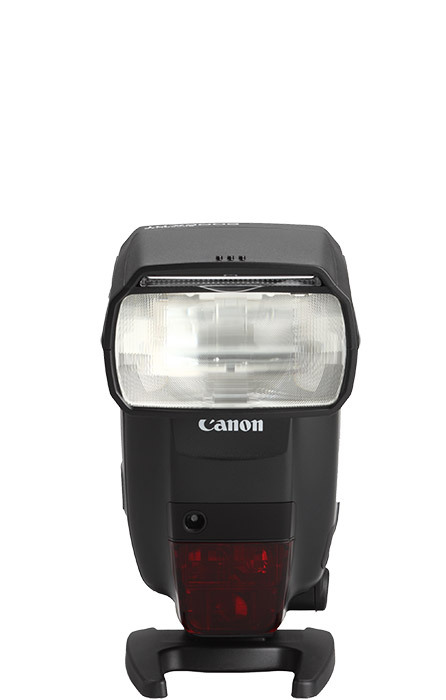 I'm questioning whether Canon USA has discontinued stocking this recently-released flash. Also small and light are the Speedlite Transmitters. As I said before, I much prefer having one of these on my hot shoe if not using flash on the camera while shooting with wireless flash. It is not small, but the Canon Speedlite 600EX-RT Flash is a solidly and thoughtfully built product with a pleasing style and design. The front of the 600EX-RT looks like most of Canon's recent big flashes. The large flash head, in addition to providing the all-important light, is responsive for optical wireless master communications. The red plastic piece covers the AF-assist beam emitter and the optical wireless receiver is located just above it. Note that the red plastic is easily scratched – plan on this happening and do not worry when it does happen. The pull-out diffusion panel can be seen in the front view along with the catchlight reflector. The small round external light meter can be seen near the optical wireless receiver. Moving to the right, the battery door becomes obvious. The 600EX-RT is powered by 4 AA batteries. I strongly recommend using NiMH rechargeable batteries that maintain their charge when on the shelf. I count on Sanyo Eneloop and Sony Cycle Energy batteries. The 600EX-RT silently recycles in 0.1 - 5.5 sec. and is rated for 100-700 shots on a new set of alkaline batteries. Those figures range from very impressive to rather slow. In real use, I find the flash to charge very quickly most of the time, but the amount of flash power being used is what makes the difference (along with adequately charged batteries). Also on the right side, the bounce head release button is seen. The 600EX-RT's head is extremely adjustable. Simply press the release button and twist the head in the direction you want light sent to. The rubber on the sides of the head provide better grip for holding the flash, for making head angle adjustments and for holding head-mounted third party accessories. 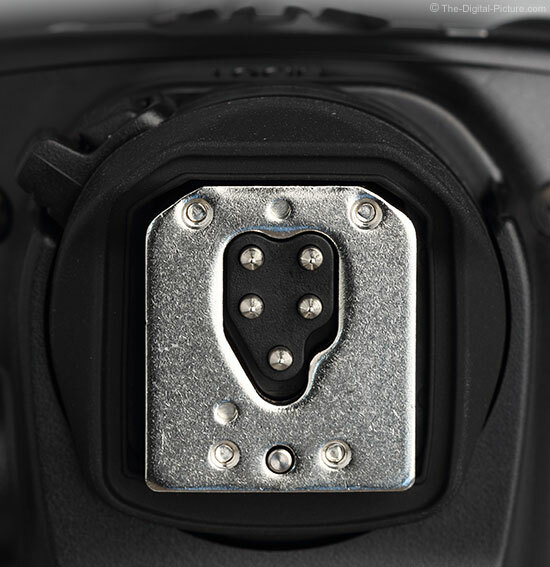 The battery door remains similar to that on the 580EX II. The door seems solid and is spring-loaded to remain open while installing batteries. We have seen and talked about the back of this flash throughout the review, but one new feature we have not yet discussed is the changeable backlight color. New for the 600EX-RT is a color (green or orange) LCD backlight that is programmable via a Personal Function. For example, set your flash to show orange when in slave mode and green when in master mode. You can clearly see the colors in the images below. The LCD backlight will also turn red and then flash red as thermal overload levels are approached. More about this soon. The back view also includes the foot lock which is worth talking about. Canon's latest flashes have a very nice lever lock mechanism, but the 600EX-RT has received an upgrade. You are certainly aware of Canon's self-cleaning sensor systems, but let me introduce you to the first flash with a self-cleaning hot shoe foot. As we have been seeing on Canon's better flashes, a metal foot once again provides attachment to the camera hot shoe (or other flash stand). Unlike anything previously seen, when this flash is locked into the hot shoe, the flash pins swipe across the hot shoe contacts to clean them before realigning into the center of the contacts. This insures that your 600EX-RT will be even more reliable than any previous flash. The switch also auto-adjusts the pressure applied to the pins for an optimal connection. What you are also seeing in the above image is the hot shoe foot's boot seal lowering into place. This design is similar to the 580EX II, which is designed to seal over the EOS 1D Mark III and later EOS DSLRs. The Canon Speedlite 600EX-RT Flash has, overall, a weather sealed design matching the level of sealing found in the EOS-1D X. Moving to the left side of the flash, we can see the various ports made available on the 600EX-RT. The port seen just under the head is the remote release terminal (shown and discussed earlier in the review). Moving down and to the left is the external power supply socket. The 600EX-RT is compatible with the Compact Battery Pack CP-E4. With the CP-E4 in use, the 600EX-RT will recycle roughly 60% faster and will deliver increased shot capacity. Recycling faster can of course lead to increased heat. And increased heat is a problem that the 600EX-RT handles better than previous flashes. When it reached thermal overload, the 580EX II simply stopped firing. When the 600EX-RT detects high heat levels, it increases the recycle time to 8 seconds, turns the LCD backlight red and displays a pair of tiny heat rays on the LCD. This is Level 1. At Level 2, the recycle time is increased to 20 seconds, the LCD backlight flashes red and three tiny heat rays appear on the LCD. This process allows you to keep shooting (albeit more slowly) while protecting the flash from permanent failure. Canon suggests a 10 minute cool-down period when these levels are reached. The port to the right of the external power source socket is the flash bracket mounting hole. The Canon Speedlite Bracket SB-E2 is the specified dedicated flash bracket, but these are not very popular (B&H and Adorama do not stock them). The SB-E2 offers few benefits and has a crazy-high price tag. Moving on down you will find the PC terminal port. This port is useful for attaching a PocketWizard or similar device – if you still need such a device now that the 600EX-RT has RF. Range remains a big advantage for the PocketWizard. An advantage the 600EX-RT offers to PocketWizard users is that it has better RF shielding than the 580EX II and 580EX. The previous flash models severely limited the range of PocketWizards and worked best when RF shields were used on the flashes. Seen near the top of the flash vertical orientation images are 2 small, recessed ports in the front and three small, raised dots in the back. These are the attachment points and sensors for the new, included Color Filter Holder SCH-E1. Using gel filters is a common need for flash photography. Use a filter to match the color of your flash output to the color of the ambient light. This allows the entire scene to be evenly white balanced. Or, use filters to creatively add color to your image. Included are Color Filters SCF-E1OR1 and OR2 – low and high density orange filters designed to match tungsten light sources. The flash detects when the filter holder is in place and one of the Canon-supplied 3 x 3" (75 x 75mm) filters is installed. Unless P.Fn-05 (Color Filter Auto Detection) is set to Off, cameras introduced since 2012 can correctly establish exposure and white balance in AWB (Auto White Balance) mode. When using non-Canon SCH-E1-specific filters, set P.Fn-05 to off. Using a filter decreases the guide number of the flash – by about 1/3 stop for the low density orange and 1 stop for the full orange. The manual warns that the filters may deform under high heat – Canon considers them to be consumables. The raised dots on the front of the flash head are catching in the front pocket of my Lowepro Toploader Pro 75 AW case, but otherwise, the filter holder is a useful feature. 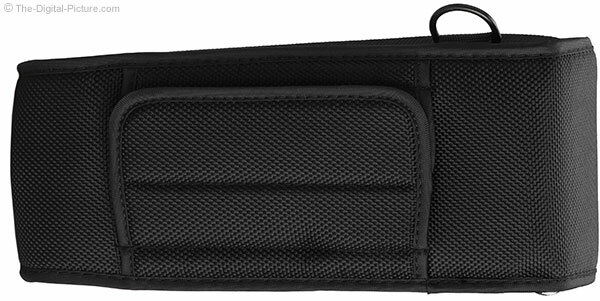 The back of the 600EX-RT case has two long flaps that Velcro closed. You can wrap these around a neck strap, to a belt or to another suitable carrier. There are many, many direct-flash-head-attached accessories available for improving direct flash image quality – I've tried many and like very few. Most simply do not create a large enough lighting surface to significantly soften the light from direct flash – not enough to be worth the inconvenience of using them. The ones I've tried with great potential – ones that have a large enough light surface – are mounted too close to the flash head to make use of that surface without an intermediary diffuser. The Westcott Micro Apollo 8" Softbox is one such example. Rogue FlashBenders are one of the exceptions. While the Canon Speedlite 600EX-RT Flash and the EOS 1D X, 5D III and later DSLRs are completely compatible, there are some earlier camera model limitations that you should be aware of. When using the color filter holder, the white balance will not be automatically adjusted when the camera’s white balance is set to Auto. EXT.A mode can be used only with the EOS DSLR cameras released since 2007. If you have viewed the Canon Speedlite 600EX-RT Flash manual, you may have noticed a Canon "Speedlite 600EX" listed on the cover. While I have not seen this sans-RF flash for sale here in the USA, you should be aware that this flash apparently exists in some locales. Make sure that you get the "-RF" version if you have any interest in the radio wireless technology. Shown above, from left to right, are the 600EX-RT, 430EX II, 320EX and 270EX II. The 600EX-RT is Canon's flagship flash, so you would expect it to also be Canon's highest price flash. And that is true, but the price is not out of line for the functionality delivered by this unit. 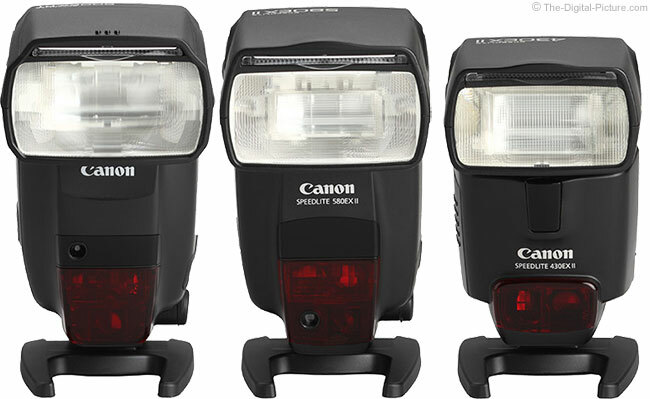 The Canon Speedlite 430EX II Flash is the next model down in capabilities, size, power and price. If your flash needs are not big (and your wallet is the same), the 430EX II is the flash you should next consider. Below you will see the 430EX II to the right of its bigger brothers. The 600EX-RT's predecessor, the now-discontinued 580EX II (center above), already had the size, weight, power and most of the key features that the 600EX-RT has. With one major exception: RF remote control capabilities. The rest of the improvements, including the much-improved LCD are icing on the cake. The optical wireless remote technology served me well for a very long time (and this technology remains available in the 600EX-RT), but as I complete this review, I have completely retired this technology from my use. The radio wireless control along with other improvements make the 600EX-RT a very solid upgrade from any EX flash including the 580EX II. Six 600EX-RT flashes and two ST-E3-RT units now compose my lab/studio/portable kit. If you are a professional or serious amateur photographer, choosing the 600EX-RT is a no-brainer. If you are buying your first serious accessory flash, this is definitely the one to get. If adding a flash to an existing system, I still recommend making the 600EX-RT your choice. Backward compatibility means that the new flash will play nicely with the other flashes in your kit and you will be preparing to take the next step with technology. Canon makes no better flash. The Canon Speedlite 600EX-RT Flash is reliable, very easy and quick to use, has powerful features and is built to get the pro's job done.